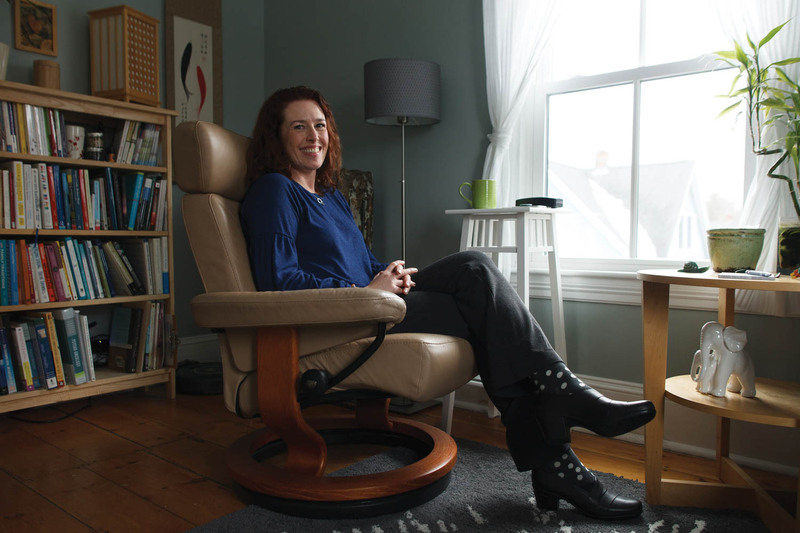 Jenna Daly, a licensed clinical social worker, always sees new patients for the first time in her office on the border of Cape Elizabeth and South Portland. But if they’re game for it, their second visit might involve leaving the office to take a walk. One of a small group of Maine therapists practicing Walk and Talk therapy, Daly uses open air settings—and movement—to help patients in her practice, Grounded Parent, relax and share. Another therapist, Katharine Appleyard of Appleyard Counseling in Bangor, has even been known to hit the cross-country ski trails with her patients. Daly treats 15–20 percent of her clients, in their late 20s to 40s, with walking therapy and says it appeals to her clients regardless of gender. She finds this a particularly beneficial approach for those struggling with anxiety and grief issues. “Reducing sustained, direct eye contact can often lessen feelings of self-consciousness and the pressure to quickly respond,” she says. “In walking together, my goal is to combine classic cognitive talk therapy skills, awareness of thoughts, and how they influence our feelings, our bodily reactions and our behavior, while being mindful of our connection with the larger world,” Daly says. The decision to try Walk and Talk therapy, a trend that started in the last decade, can also be purely about convenience. Some of Daly’s clients bring their infants or toddlers with them to a session, pushing them along in a stroller. They skip the sitter and get exercise at the same time. Fresh air can make a difference for someone struggling with an emotional issue or in a real crisis. In Bangor, Appleyard says her private practice clients express a longing to feel more connected and engaged in the world around them. Walking during a therapy session is a win-win, she says, because it gets their blood and the conversation flowing. Appleyard is a native Mainer who studied clinical counseling at the University of Puget Sound in Tacoma, Washington, and lived in the Northwest for 13 years. She practices mind-body connection in her personal life and her career has included stints in wilderness therapy, education and alternative dispute resolution and education. About half her patients choose to walk with her during the warmer months.“Based on these experiences and the various settings in which I practice, I have observed the benefits of physical movement and time spent in the outdoors on overall well-being,” she says. 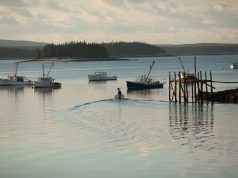 This being Maine, there are limits based on weather. Currently Daly offers a walking and talking option only when it is comfortable to be outside, from late April when all the ice is gone to mid-October. “Incorporating winter movement is important to me as this is a difficult time of year for my clients. I need to be creative in how I adapt my practice to best support them,” she says. 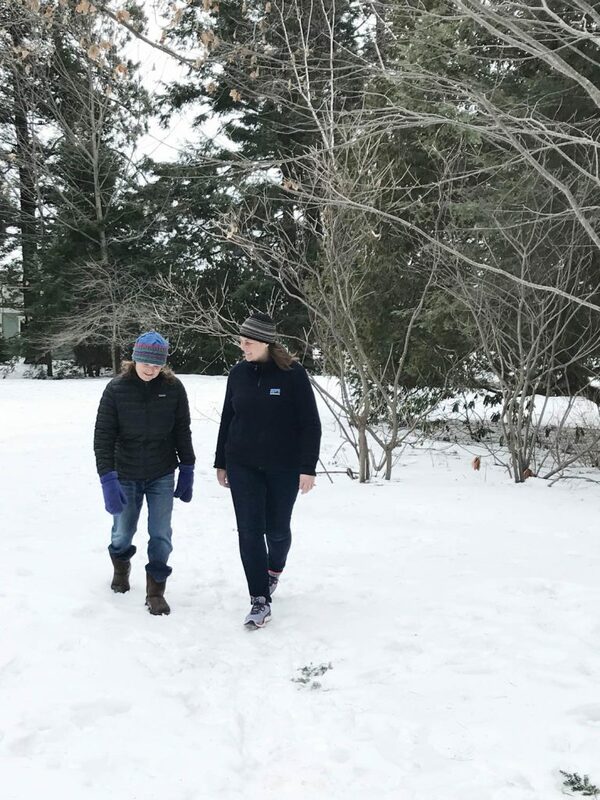 Cait Farrell, a Portland-based clinical psychologist whose practice is actually called Walk and Talk Counseling, says some of her best sessions have been on Maine’s trails in the midst of a snowy day. Farrell uses this moving therapy as a natural extension of her own experiences. She spent time on a dude ranch in Montana as a child, and it was there, being in the outdoors, riding horses, exploring trails and mountains, that she discovered how easy it was to talk to others while moving. “It takes the mind off of trying too hard,” says Farrell. Her sessions are about getting clients who aren’t as comfortable sitting in a clinical office outside, which can help their flow of thought. Farrell, a graduate of Loyola University’s master’s program in clinical psychology in Baltimore, says she has 15–20 clients who prefer walking therapy, half of those being women. These therapists point out that Walk and Talk therapy isn’t intended to be a workout. Appleyard promotes sticking to a comfortable walking pace to allow for continuous dialogue during the session. Farrell makes sure to keep the walks at a conversational pace. “We often pause on the walk to talk, be silent, cry, laugh, or stare into space,” Farrell says. Daly says she never walks too fast with her clients. The purpose is to be able to talk and shortness of breath can trigger feelings of anxiety, she says. Not everyone is a fan of walking therapy, including Karen Maroda, a Milwaukee psychologist who is a fellow with the American Board of Professional Psychology. “The benefits of exercise for mental and physical health are indisputable,” Maroda says. But she questions whether the therapeutic impacts are the same outside of a private, unvarying space. “A sense of safety and continuity are considered essential to facilitating trust and the process of dropping defenses to experience deep emotion,” Maroda says. Maroda also worries about the important, necessary boundaries that might be crossed. “It can be much harder for clients with boundary issues to accept that they can’t have a relationship with their therapist in the real world if they are free to go walking with them,” she says. She also wonders what happens when patient and therapist bump into someone on the path? “To simply stop talking when another person appears is disruptive and ineffective,” Maroda says. Meeting in private also keeps the integrity of the confidentiality of the session. If you are out walking with your therapist, no one knows if you are going to run into someone you know, she says. Appleyard always discusses confidentiality with her clients, reminding them to pause when they are in earshot of other people as it helps establish professional and ethical boundaries. She says this helps her clients feel safe. For Daly, a bigger challenge with walking therapy is gauging the time. She needs to determine how far she walks with her clients before it’s time to turn around. She doesn’t write notes during or after her walking sessions, but says there is something about walking that makes it easier to recall key concepts. She links them to where they are in the walk when they occur. For this therapist, physical landmarks create a map of the mind.